Each month, we work together as a church family to make a difference for those in need. It might be something that helps those within our own congregation, something that helps our those in our community, or something that helps our world. When everyone pitches in a little, we can make a big impact! It’s the time of year when parents begin to plan and schedule summer activities for their children. Soccer, baseball, softball, and swimming lessons are all wonderful opportunities for children to learn and to grow. There are families that simply cannot afford to provide those opportunities for their children. Our April Mission of the Month will be to give scholarships to cover these fees. The money will be disbursed by IMPACT Ankeny so that when families come in to utilize their services, these funds will be made available. Let’s help kids have a great summer! Find a Mission of the Month offering envelope at our Welcome Centers or simply indicate this on your check memo line. Since 2009 our congregation has had a strong and growing relationship with the United Methodist Church in the small African democracy of Malawi. Representative from our church have traveled to Malawi each year since, and we have welcomed a number of Malawi UMC visitors to Iowa. We call our relationship with them a Partnership of Hope, because it is a ministry of presence or encouragement. We have funded various projects in Malawi through our mission giving, seasonal offerings, and through 5% of a capital campaign. During our annual trips, we have the opportunity to view the projects which we have funded. The Tailoring School: A second center of emphasis for our congregation is the Tailoring School in Mzuzu, in northern Malawi. Begun by their pastor, Copeland Nkhata, this program gives semi-literate women the opportunity to learn to sew, providing them with a way to support their families. Our congregation has paid the salary of the tailoring instructor, celebrated the student’s graduation, and most recently paid for the construction of a new facility for the tailoring school and pastor’s office. In addition, each year, our congregation funds 1-2 boreholes in areas designated by the Malawi UMC, and encourages local churches and their programs for vulnerable children. Ankeny First United Methodist Church has an informal partnership with Trinity United Methodist Church, 1548 8th Street, Des Moines, with the goal of blending urban / suburban ministries to the benefit of both congregations. Trinity UMC has been serving the Riverbend community of Des Moines for nearly a century. The church location on 8th street houses a shared ministry with Las Americas Comunidad de Fe and offers a weekly bi-lingual worship celebration in English and Spanish. Children and Family Urban Ministries: This ministry addresses the challenges and builds on the strengths of those living in the near north side of Des Moines. Justice for our Neighbors: This is a network in mission of the United Methodist Committee on Relief, Annual Conferences, local congregations and ecumenical partners that operate volunteer-based immigration clinics. For more information about when they offer clinics at Trinity, visit their website . Please place these items in the large designated wooden bin outside the Uptown church office. Thank you! Located on the grounds of our Faith Chapel location at 7384 NW 16th St. in Ankeny, Agape Garden is our church’s ministry to provide fresh produce for area feeding ministries. From spring planting through fall harvesting, a dedicated team of volunteers from our church and several other partner churches plant, tend and harvest the vegetables and fruits, and then deliver them to various feeding ministries around the metro. Each year, Agape Garden has grown. In 2010, we received Honorable Mention from the World Prize for a community garden effort. In 2015 we were able to raise and donate 21,969 pounds of produce! Area agencies and ministries receiving produce include Bethel Mission – Hope Ministries, DMARC Food Pantry (Ankeny Neveln Center), North Branch Lutheran Church of Hope Ankeny Food Pantry, Trinity United Methodist Church, and our congregation’s “Homeless Helps” meals. Regular season work hours: 5:30-dusk on Tuesday & Thursday evenings. 8:30am-noon on Saturday mornings. If the above times don't work for you or your group, please contact one of the team members and they can guide you in tasks/times to accommodate your schedule. 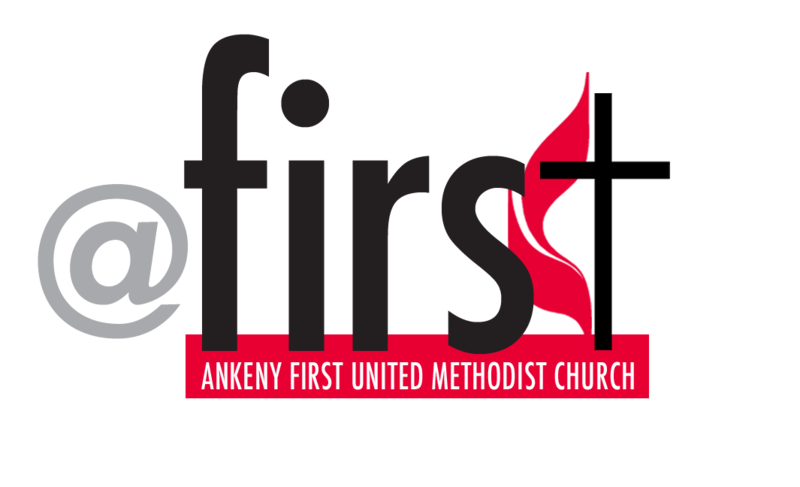 Ankeny First United Methodist Church is one of the founding members of the Ankeny Circle of Faith - an ecumenical group working with Greater Des Moines Habitat for Humanity, dedicated to cooperatively raising funds, materials and volunteer labor to build houses for families in need. Formed in 2001, the Ankeny Circle of Faith has participated in the creation of seven Habitat homes. Greater Des Moines Habitat for Humanity partners with God and all members of our community to build simple, decent housing which strengthens families and transforms neighborhoods through home ownership. Habitat Fact: Habitat homes are sold to partner families at no profit and are financed with affordable no-interest loans. The home owner's monthly mortgage payments are used to build still more Habitat homes. Impact: Affordable housing creates all sorts of possibilities for Habitat homeowners and their children. It was recently shared that the owner of one Circle of Faith home recently graduated from Drake University and is now teaching full time at a Des Moines high school. Many Circle of Faith partner families have had similar success stories. Thank You! Chances are you have reached this page because you have been invited to join us in the call to eliminate hunger for those in need around the Des Moines metro. Every third weekend, we designate as "Food Pantry Weekend." This is where we encourage all of you to bring non-perishable food items to your worship location and place them in the designated big, red bins. We also highly encourage you to donate monetarily because DMARC is able to purchase food at a bulk rate much more inexpensively that we can at a local grocery store. Simply write "DMARC " in your check memo to Ankeny First United Methodist Church. Visit the DMARC site to see their current most needed items. Ankeny First United Methodist Church is one of the 150 congregations that support DMARC - the Des Moines Area Religious Council. DMARC is an interfaith organization that exists to provide a common means of responding to basic human needs. One of DMARC's programs is the Emergency Food Pantry, which provides food at no cost to nine food pantry sites in the Des Moines area, including one site in Ankeny. Twice annually, we will focus the Mission of the Month on the Food Pantry: November and a summer month. Watch for those details. Souper Bowl Sunday - Annual event corresponding with the NFL Super Bowl. Cash donations and canned goods are collected. We as a mission team also want to support other local agencies that feed the hungry. There are always opportunites to volunteer and donate to IMPACT (in Ankeny) and Bidwell Riverside Center (in Des Moines). Please visit their websites for more information. The Family Promise of Greater Des Moines (FPGD) assists homeless families with children through a network of 13 religious congregations that provide clean, safe overnight shelter and nutritious meals for a period of one week every three months. Ankeny First United Methodist Church participates as a host congregation for FPGD. During our hosting week, Ankeny First provides each family with a private room for sleeping at our Faith Chapel location. We also provide supper and breakfast at Faith Chapel, and food for packing a sack lunch each day. Guests are provided a safe, secure place to be during the day at the FPGD Day Center which is located at Westminster Presbyterian Church in Des Moines. At the Day Center, guest have access to showers and laundry facilities, as well as a telephone with answering machine, daily newspaper and the Internet to assist in their employment and housing searches. "For me, being a Family Promise volunteer is all about fulfilling Mathew 25:40, 'I tell you, whenever you did this for one of the least important of these brothers of mine, you did it for me.' When we provide a friendly, welcoming temporary home for our IHN guests and ensure that all members of a family can stay together we realize our mission to seek, grow, serve in Christ. Being a volunteer is truly a blessing in my life." Women at the Well is a United Methodist congregation inside the walls of the Iowa Correctional Institution for Women in Mitchellville, IA - one of only TWO chartered United Methodist congregations of this kind, and one of approximately 19 worshipping communities inside prison walls around the U.S.
Why a prison congregation? It's a response to Jesus' words, "I was in prison and you visitied me." It is a place for the women to "be" the church; worship and ministry aren't just brought in from the outside, but are an expression of their call to these women to participate in the Kingdom of God. Women at the Well UMC is a mission congregation - which means that it will never be fully supported by its members (most incarcerated women are employed but earn less than a dollar per hour). Women at the Well receives only about 40% of their support through the larger United Methodist Church of Iowa, and depend greatly on the financial support of churches like Ankeny First who covenant with them to be a partner church supporting them with our prayers, presence, gifts, service and witness. Keep up to date on what is going on at Women at the Well. "Like" their Facebook page and hold them in prayer. Support them with your financial gifts. You can place money designated for Women at the Well in the offering place at any time, or give to them along with your online contributions to the church. As a partner church, 8-10 of us may attend worship at the prison twice a year (Thursday evenings at 7:00pm). Their pastor, Rev. Lee Schott, preaches at Ankeny First annually. Watch the bulletin for those details. Go through training at the prison and get your yellow badge which entitles you to visit the prison to volunteer to work and worship with the women more frequently. Learn even more about Women at the Well by visiting their website at www.womenatthewellumc.org .